Spa is naturally the spa town of Belgium, home to the famous hot healing mineral springs which are considered healing waters. The town today is more famous for the mineral water producer of the same name and Spa is also home to the Circuit de Spa-Francorchamps, which hosts the annual Formula One Belgian Grand Prix. There has been a golf course at Spa for at least 100 years but the course we play today at Royal Golf Club des Fagnes was laid out at great expense and it was designed by the flamboyant English architect, Tom Simpson. In 1930 the new course was ready for play with nine holes routed across the sandy heath which was the site of the original Spa course and the other nine was carved through the adjoining pine forest. Each hole at Royal Fagnes has its own character and the two nines, although contrasting – front nine in the woods and the back nine in the heather – make up one of the most beautiful 18-holers in Belgium. So we dropped off our friend at the Spa just down the road (when in Rome, he said) and 10 minutes later we were on the first tee. It was an incredibly hot day and we hoped we wouldn’t regret the decision to play Golf. The course begins with a downhill right to left dogleg short par 5. You don’t see too much, except a lot of trees. Enough space though so you can lash away. It might play better as a long 4 - my playing partner (handicap 15) had a 25 foot eagle putt after hitting 2 irons. The third hole had more interest as a short 5. On the second you’re faced with a well protected short par 3 and despite it being a pretty hole, you soon see a bit of an issue at this course - trees are encroaching - particularly with shots into greens. Later on there were also a couple of holes where fairway bunkers were half obscured by trees. Despite being a part-time environmentalist, I would dust off the chainsaw in this part of Belgium. That’s really the only negative though. This is an engaging and picturesque course, with plenty of variety and a nice tumbling routing over the land. It seems to pull off a neat trick of having more downhill shots than uphill, despite not having lots of walking up to raised tees. I preferred the more defined holes of the front 9 rather than the more spacious back 9. They did feel a bit different from each other, so it depends what you like. I particularly enjoyed holes 5-7 on the front 9 and also enjoyed the 9th - lay up left of the heather or take the racing line towards the green? In his part of the world you may be tempted with the latter. Conditions were firm and fast so you could often use the contours of the ground when executing shots. And as we all know, that’s fun. The only hole that fell short for me was the 10th. As you cross the road to start the back 9, this 90 degree short par 4 dogleg right felt like one of those holes you shoe-horn onto a lesser property. Perhaps they could add interest by removing some trees on the inside to allow for a tempting view of the green. 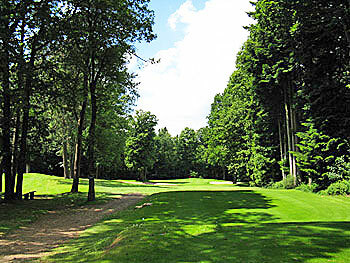 Of the 3 Tom Simpson forest courses I’ve played, Royal Golf Club des Fagnes has perhaps a bit more interest than Royal Antwerp, but didn’t feel quite as regal as Hardelot Les Pins. I’d say it floats between a 4 & 5 ball rating. In the UK it might be a 4, but in Benelux a 5. Perhaps that’s the Sterling - Euro Golfing exchange rate for you. Played Fagnes mid-april. Cold air but blue sky: wonderful conditions to play this beautiful undulating woodland course. I agree with a previous review that reversing the course order (1-9 becoming 10-18 and vice versa) would indeed be an excellent idea. The beauty of the course is revealed by the first nine holes. The last nine are more demanding from a golf perspective (except for hole n°5 – stroke index 2, a real challenge requiring length, precision and finesse) but miss a bit the look. Most greens in very good condition although a bit slow (beginning of the season?). Royal Fagnes is a very private club but that didn’t prevent the visitor to enjoy a warm welcome and to have some nice local beers at hole 19 with very sympathetic local members who are proud of their club. Highly recommended. A true gem at 1h15 drive from Brussels. If I had to be a member at only one club in Belgium it would be Fagnes. Spa is a wonderful town and this is a wonderful course perhaps not quite as stellar as Zoute but not far off. Fagnes is from the top drawer. I did play this course in 2007 with a couple of friends. One of the best courses I have ever played on the European continent. Nice environment, good facilities, and a good atmosphere.